Sometimes you've got the budget for a full-out kitchen renovation project, and sometimes you just don't. 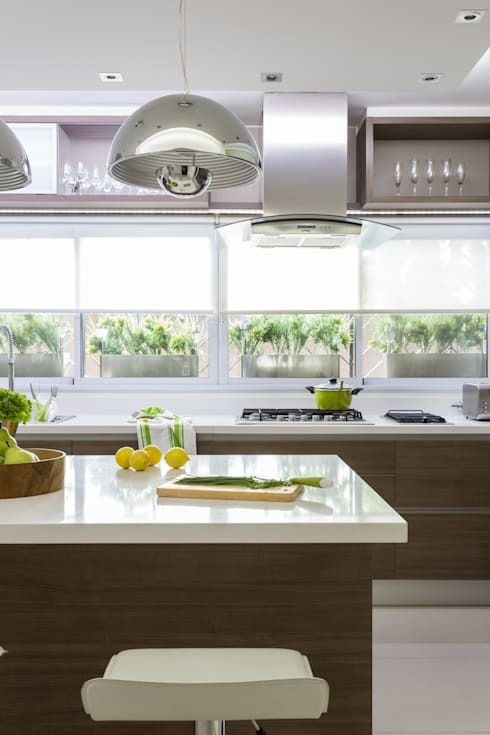 Here are some ways to give your kitchen space a facelift without spending the big bucks – many of these ideas are projects that you can do yourself! Roll up your sleeves and see how you can singlehandedly transform your kitchen on the cheap. Wishing you had a new floor, backsplash, fridge, or cabinets? All of these are features that can be resurfaced without changing their infrastructure. Wall stickers and floor stickers come in all shapes and sizes, included some really fun tiled patterns. Likewise, you can buy sheets of adhesive material that sticks to your fridge to give it a new look. In this example, the homeowner opted for some bright new cabinet doors – notice how the light blue color adds instant style and calmness to the kitchen. 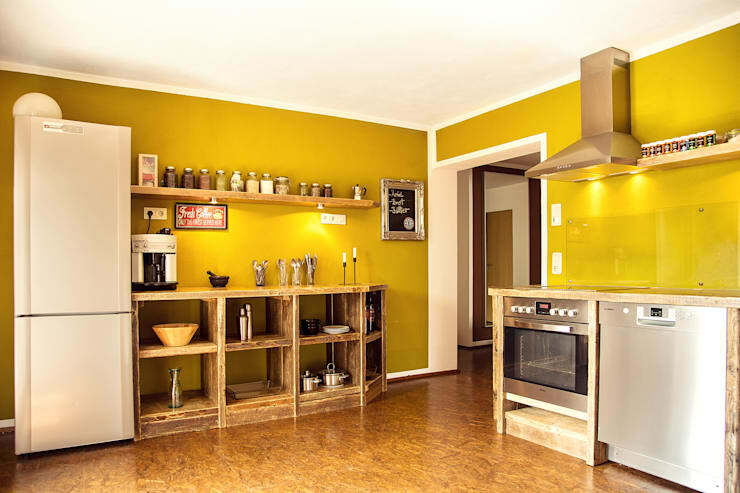 Yellow is an ideal choice for kitchens: it's said to have metabolism-boosting effects, and it adds vibrancy and a healthy, sunny feeling to your space – the perfect mood to set in a place where you're cooking up a storm! This kitchen features a mustard yellow wall that gives a rich, golden tone to the space – who wouldn't enjoy such a luxurious, warm glow in their kitchen? So, if your space is feeling blah, a good rule of thumb is to add yellow. You don't have to paint the walls like in this one – you can simply purchase a yellow vase as a centerpiece on the table, or hang a few paintings with bold yellow tones on the walls. 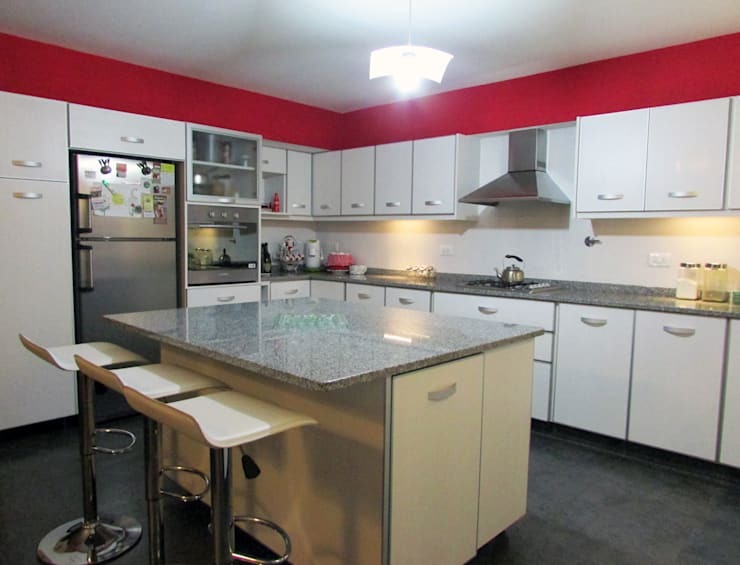 Here, the obvious accent is the striking red stripe that runs along the top of the kitchen walls. What could be empty white space has been turned into a modern, angular statement! Adding an accent like this is a great way to liven things up. Consider an accent wall, or simply an accent tablecloth. If you're feeling adventurous, you could even look into an accent fridge – despite the custom of buying a silver, white, or black fridge, you can find these appliances in all sorts of fun colors. Hands down, any space can be freshened up with plants. Grow your own wheatgrass in trays, or invest in a few succulents to sit on your kitchen windowsill. Better yet, find a spot for starting your very own herb garden and benefit from not only the aesthetic appeal, but the flavorings from fresh oregano, basil, and thyme! Sick of staring at your appliances, pots and pans, dish soap container (and the list goes on)? Choose to add a few items that really highlight your sense of design. In this example, the kitchen features a small but glamorous hanging lamp and a striking photograph of red poppies on the wall. 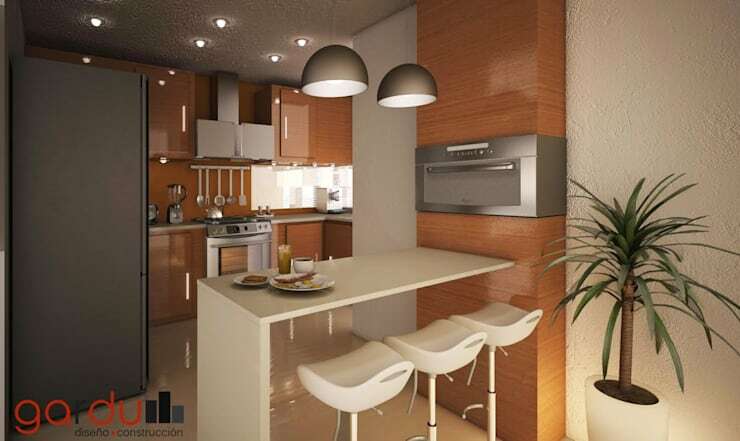 Adding elements that go beyond functional will make your kitchen feel like a more artistic, creative space. You may be feeling glum about your kitchen because it's simply a bit too dim. Low lighting can translate into low energy, and may not leave you feeling the greatest about your cooking space. Your kitchen should be well-illuminated so that you're inspired to spend time at the counters, cooking up delicious recipes from scratch and enjoying every little detail along the way. 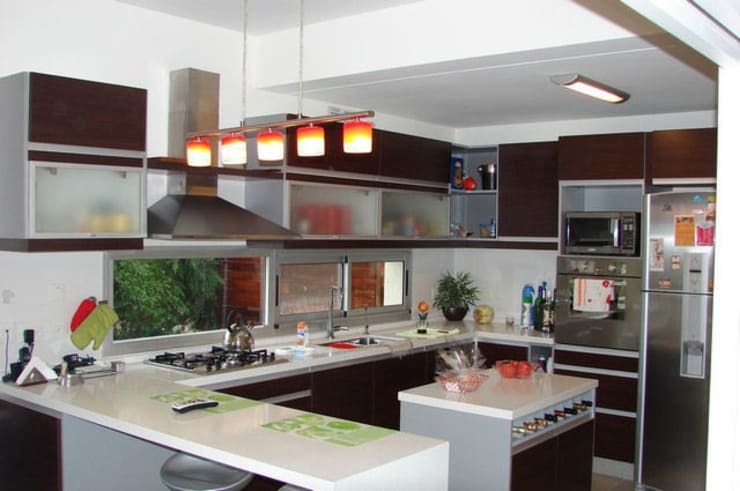 Add track lighting, hanging track lighting (as this kitchen has), or even a simple standing lamp. You'll be surprised at how the fresh source of light puts things in, well, a new light! 7. Or, change the lights. Have a look at your lights. Are you staring at a generic white ceiling light, or a brassy lamp from the 80s? Time to change the light. Light is what the eyes look for in a room, and since it's bound to grab your attention, changing your lighting style can work wonders for refreshing a space. In this example, the wood-and-white themed kitchen has ultra-modern rounded lamps that tie together the various stainless steel appliances – but with lighting, the sky is truly the limit. 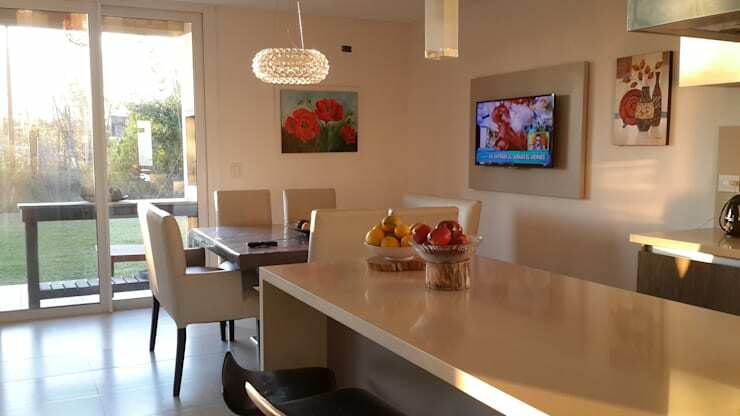 You can begin to explore your lighting options on homify today! Sometimes, a kitchen feels dull because it's constantly cluttered. Fight the tendency to leave things out by making it attractive and simple to put them away. 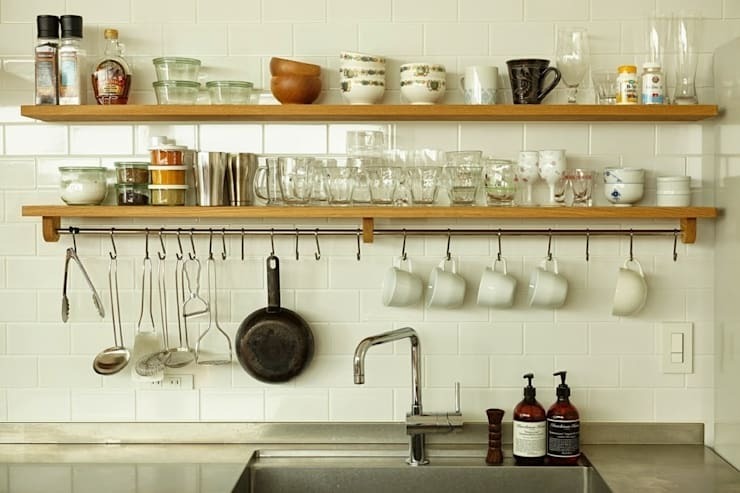 This kitchen features a clever solution that includes two shelves for stacking up plates, cups, and bowls, with wire hooks for hanging mugs, utensils, and pans below. The best part? You get storage space without the headache of installing cabinets! Going beyond the kitchen? Here's another ideabook that offers DIY advice like this for your whole home. 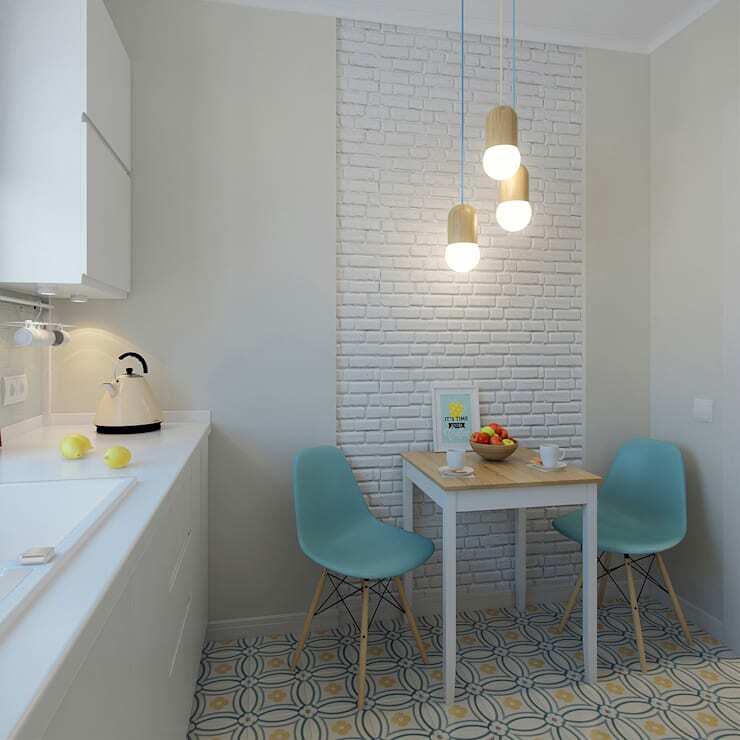 This boring kitchen has become a friendly little space with two cute blue chairs and a tiny table to match! 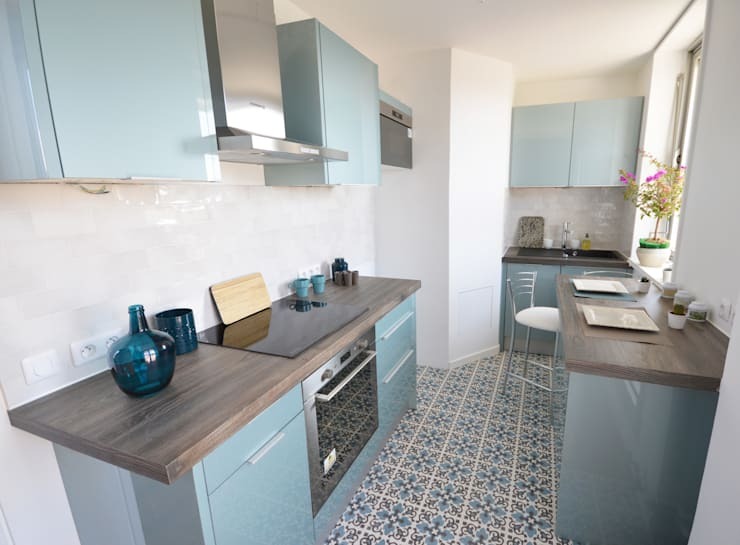 Although the space is small, it's become interesting with this addition, which is both sociable and convenient, turning the kitchen into a place where you'd actually like to spend time. Notice how the lower height of the hanging lights emphasizes this nook and separates it from the rest of the room in a space all its own. There are two options for adding a chalkboard – you can simply buy a chalkboard, or you can buy chalkboard paint and cover the surface of you walls with it. 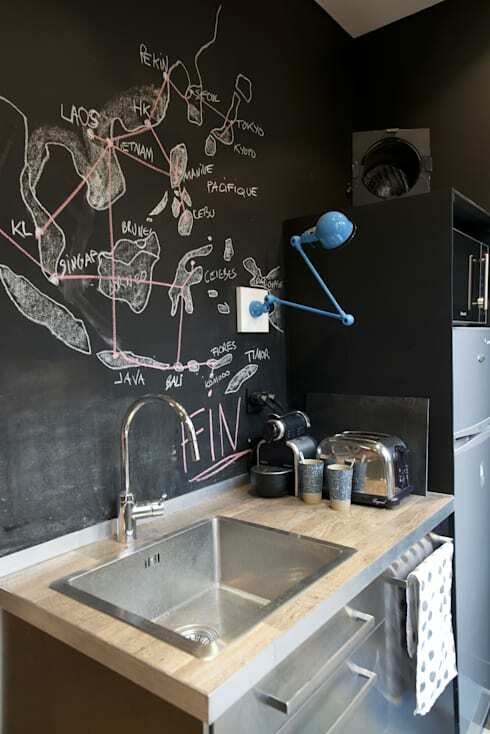 That's what you see in this kitchen, which features a creative drawing of a map above the sink. If you're prone to wanting to update your kitchen every 4 weeks, chalkboard paint is the solution for you. Not only is it practical in that it allows you to write notes and shopping lists, it's also a blank palette for updating your design whenever you please! Looking for more kitchen inspiration? Have a look at this ideabook on Rural Style: 10 Easy Kitchen Ideas. What do you think of these DIY kitchen ideas? Share your insight below.